iTunes can't do it, but iCopyBot can! iCopyBot is the quickest and easiest way to get music, photos and videos off of your iPod, iPad and iPhone and onto your computer. With iCopyBot, you never have to lose your music again! Carries No Adware or Spyware! Reinstall your system or iTunes library. 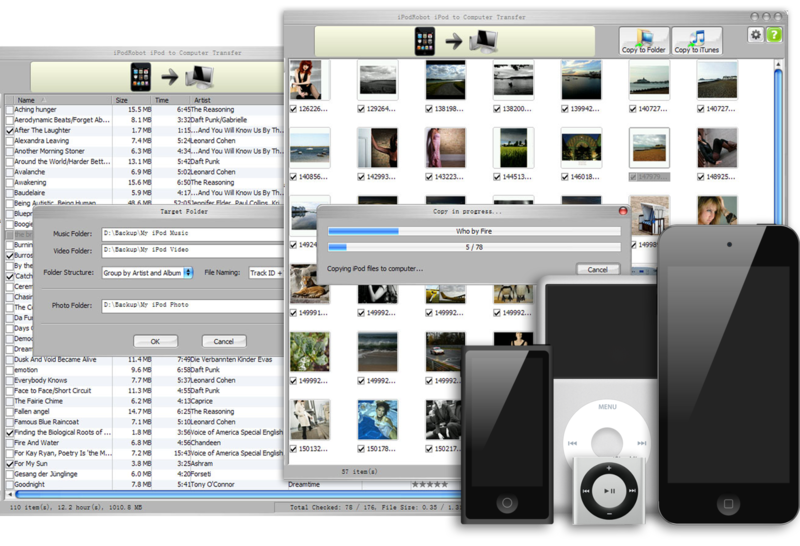 Retrieve your music, videos and photos from your iPod, iPad and iPhone and save them to your computer. Share your iPod, iPhone, iPad contents with friends and family. iCopyBot is a data transfer program that makes sharing, saving and transferring your iPod, iPad, iPhone ’s contents so much easier! It transfers batches of songs, videos, photos and even playlists from your iPod and copies them to a computer folder or into your iTunes library. Easily transfers all music, videos, e-Books, ringtones and photos from your Apple device to your computer folder or iTunes. Seamlessly rebuilds your iTunes library. Maintains your song ratings, comments, play counts, song order, volume adjustments, playlists and even artwork. Helps keep your output folder organized. Only reads data from your iPod, iPad or iPhone. Compatible with All Models of iPad, iPhone, and iPod. Music, Video, Photo, eBook, and Playlists transfer seamlessly. Protects your iPad, iPod, and iPhone against unwanted iTunes synchronization. Receive lifetime upgrades for FREE on all future models of iPad, iPod, and iPhone. iCopyBot is a nice program that can be extremely useful when handling these devices. Less experienced individuals shouldn’t have any troubles while installing or customizing the utility, thanks to its intuitive layout and overall simplicity. iCopyBot is pretty impressive: it moves 2.41 GB of songs to iTunes in 10 minutes. What happens after I order iCopyBot iPod to Computer Transfer? You'll receive registration information by email in just a few minutes. How much do program upgrades cost? Can I legally use a program on several computers with just one license? You can use a license on as many computers as you personally own. This includes all the computers of a small family living under the same roof and your computer at work, if it is primarily used only by you. Will iCopyBot iPod to Computer Transfer protect my iPod against unwanted iTunes synchronizations? If your iTunes is version 7.0 or later, the anwser is Yes. Your iPod will be protected against unwanted automatic detection, synchronization or deletion by iTunes, as soon as you open iCopyBot iPod to Computer Transfer. Can I use iCopyBot iPod to Computer Transfer to take songs off a friend's iPod to store them on my computer? Only if these songs are not copyright protected.